This summer, I finished the second book of my Dutch middle grade series Boreas and the Seven Seas (Boreas en de zeven zeeën). The first book came out in June and reviews are coming in now summer is over. It seems kids, adults and reviewers alike love this new adventure book that tells the story of 12-year-old Boreas, who has to go on a round-the-world trip with his parents. Needless to say, Boreas isn’t psyched about this adventure. Which 12-year-old wants to spend three years on a small boat with his parents? Boreas wants to hang out with his friends, go to soccer games, start high school after summer break. But he has no say in the matter, no choice. They will board the Argo, an old First 42, and they will sail. Initially, Boreas is bored out of his mind, but then he ends up in adventure after adventure, from colliding into a young refugee’s raft in the coastal waters of France, to a tractor race on the Channel Island Sark, to a scary stowaway adventure on a Spanish fishing vessel with his best friend Merel, who joins them during summer break. 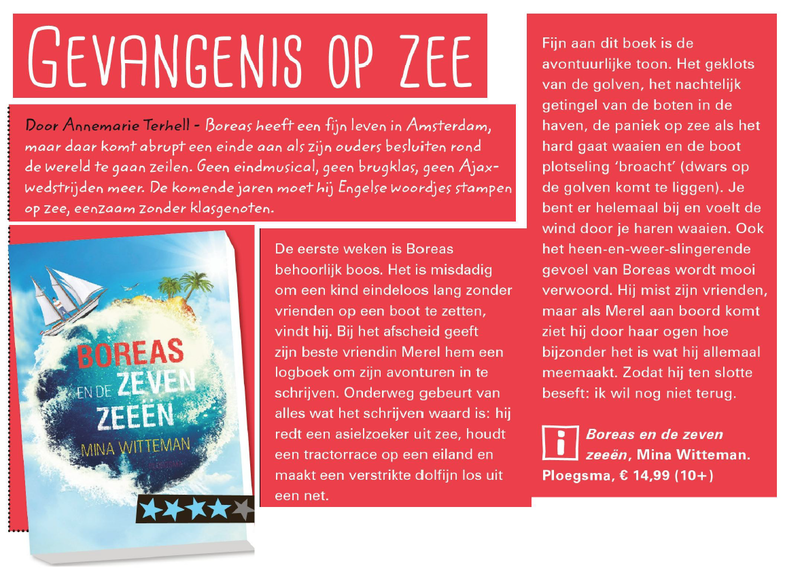 Boekenbijlage wrote: “Boreas’ story is informative and thrilling and makes you forget on which beach you are. You experience the waves and the wind as if you are there, and you feel Boreas’ doubts after he starts seeing the fun part of traveling. Action, drama, bantering and mortal fear. It’s all in there. And breathlessness, but that’s mainly with the reader. Because you want to read this book in one go, even if it’s hard with over two hundred pages. Readers on Goodreads give it high ratings and say sweet things about the book and about how they couldn’t put it down. For my earlier novels, I received similar compliments. How does that work? Make your readers feel as if they are living your story? My secret is that I make sure I have experienced what my protagonists experience. If my main character trudges through a scorching desert, you can rest assure that I have trudged through a scorching desert. Does he have to find his way on an icy and creepy-misty mountain? You can bet I wandered through ice and snow and mist on a mountain. Does my protagonist tumble down a waterfall in a kayak? Then you know, I cascaded down a waterfall head-first, too (on raft to be honest, not a kayak). I experience firsthand what my main characters go through and I can relate to the pumping of the heart, the chills that run up your spine when you go under in churning waters, losing track of what’s up and what’s down, and not knowing if you’ll ever surface again. That I put into my books. That feeling, that hair-raising notion of excitement when doing things you’ve never done before. With Boreas it was an easy ride as I am a sailor, too. My dad taught how to sail before I could even ride a bike, and when we were old enough he bought a bigger boat and we roamed the seas every weekend and every holiday. Like Boreas’ parents, my parents sailed the seven seas for twelve years and I had the pleasure to join them often. Boreas’ adventures at sea, are my own adventures pulled from my memories. Broaching while spinakering, climbing the mast at mid-sea, feeling how the swell and the waves roll the boat. Now I have finished the second book of the series. It’s scheduled to come out early 2016 and I am eagerly awaiting the comments and feedback of my awesome editor Marlous. A nail-biting adventure in itself. I thoroughly enjoy writing Boreas, because while writing his adventures I can feel how the wind pummels my face and how it blows my mind free. I can taste the spray of water on my chapped lips, smell the briny tang of the sea, hear the high-pitched voices of dolphins telling me a story. My hope is that Boreas and the Seven Seas will travel the world like Boreas does and that one day everyone everywhere can read my books. If you read Dutch, Boekenbijlage featured an interview with me to find out what drives me in writing. As an avid sailor I love the concept. I just finished a middle-grade book on my experience as a paperboy in the 1960s. Good luck to you! Thank you, Terry. Isn’t writing for middle-grade the best! good luck to you, too!